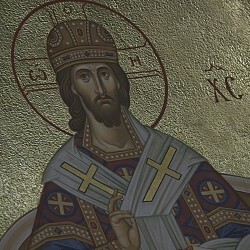 On Sunday, May 6, 2018, The 5th Sunday of Pascha and the feast day of St George the Victory-Bearer and Great Martyr, His Eminence Archbishop Kyrill of San Francisco and Western America celebrated Divine Liturgy at the Synodal Cathedral of Our Lady “of the Sign” in New York City, along with the Senior Priest of the cathedral, Protopriest Andrei Sommer. The Head of the Russian Imperial House, Grand Duchess Maria Vladimirovna and her son, Tsesarevich and Grand Duke Georgy Mikhailovich, who was celebrating his namesday, prayed at the service. At the end of services, Archbishop Kyrill addressed the Grand Duchess and Grand Duke, and congratulated everyone who was celebrating their namesday. 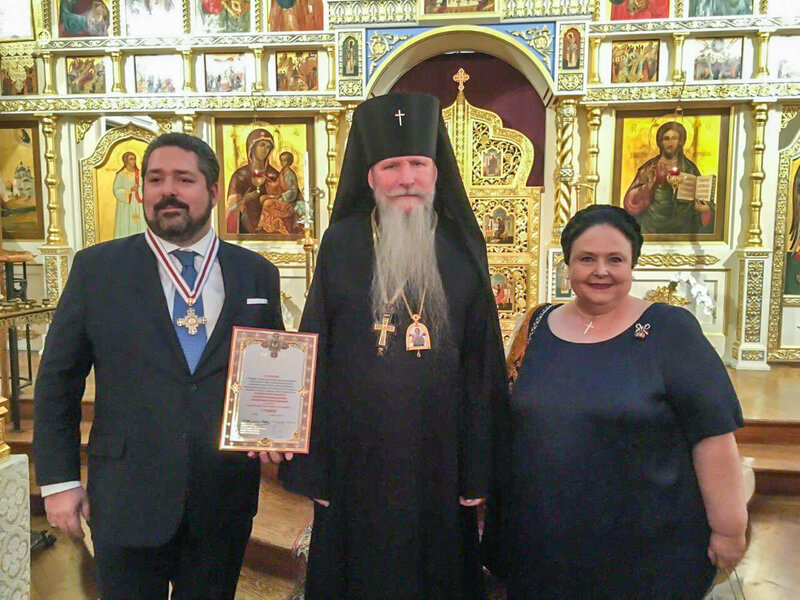 With the blessing of His Eminence Metropolitan Hilarion of Eastern America and New York, First Hierarch of the Russian Orthodox Church Outside of Russia, Vladyka Kyrill gave Grand Duke Georgy Mikhailovich the Medal of St Rafael of Brooklyn, First Degree, “for earnest labors in bolstering the good efforts of the Imperial Foundation in researching oncological illness, and for the many years of selfless and noble service to the good of the peoples of our Fatherland and the Russian Diaspora.” The Grand Duchess also received a memorial gift from Archbishop Kyrill. His Eminence then congratulated the Synod Treasurer, George Schatiloff, on his namesday. At the end of the ceremony, Peter Fekula led the Synod Cathedral Choir in singing “Many Years” to those celebrating their namesday. A photogallery may be seen here.